The Highways Agency today thanked drivers for driving with extra care on the A421 near Bedford during ongoing roadworks. A £4.5million project to resurface the A421 Bedford southern bypass between the A6 at Elstow and the A4280 at Renhold started on 17 November and is using a different technique that will mean a better, longer lasting road surface for drivers. The work started on the eastbound carriageway and will improve 5.6 miles (9km) of this Bedfordshire road which is an important strategic link to and from the M1. Using this technique to replace a road surface offers significant benefits, but requires drivers to use a temporary road surface during the day, with a reduced 40mph speed limit. We’ve been very impressed with the extra care drivers have been taking while travelling through the roadworks so far, and we’d like to take the opportunity to say thank you. Normally for this type of maintenance we would have replaced patches of the road surface, but on this project we have taken a different approach which means the roadworks can be completed more quickly, the new road surface will last longer meaning less frequent roadworks in the future and offers better value for money than the traditional approach. The work will continue to be carried out overnight and as many restrictions will be removed as possible during the day. It will involve closing one carriageway at a time, and is due to be completed, weather permitting, by 27 February. 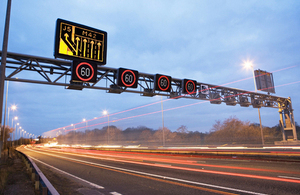 The works will be lifted during the Christmas period but the 40mph speed limit will remain.